In the winter when the cold weather blows in, you might find it hard to motivate yourself to get out of bed or even leave the house. Shorter winter days also mean less sunlight every day and sunlight helps us feel wide-awake. You might be experiencing a winter slump and a drop-off in energy levels like many other people. And when lacking in energy, many people look towards food for an extra boost. Make sure you’re choosing the right foods year-round and follow these tips for beating your winter blues! Mood, sleep and appetite are regulated by serotonin, dopamine and norepinephrine. Folic Acid, or folate, helps your body to process and lower homocysteine levels. High levels of homocysteine are associated with damage to blood vessels, in addition to interfering with the flow of blood and nutrients to the brain. Impaired blood flow may leave you feeling sluggish or slow to process or recall information. Good sources of folic acid are green leafy vegetables (spinach, broccoli, kale, Brussels sprouts), potatoes, fortified breads and cereals, beans, peas and mushrooms. Omega-3 fatty acids have hormone-like effects and anti-inflammatory properties in the body. People who experience seasonal depression during fall and winter have been found to have lower levels of omega-3s. They have also been found to experience an improvement in mood with supplementation of this nutrient. Omega-3s are found in fatty fish like salmon and tuna, some plant oils (flaxseed, canola), and walnuts. The body normally makes Vitamin D from sunlight. This nutrient has many different roles in the body, one of which is to help in the production of serotonin. Serotonin is a neurotransmitter that helps you to feel calm, relaxed and happy. Many people are lacking in Vitamin D in the winter because of fewer daylight hours and exposure to sunlight. Currently, Vitamin D is being investigated for its ability to decrease depressive symptoms. Eat foods that are a good source of this vitamin. Low fat milk is fortified with Vitamin D, in addition to many cereals and some orange juices (check the labels). One important thing to note is that food sources of Vitamin D are limited, and many people are deficient in this nutrient without even realizing it. Depending on your diet, you may need to take a Calcium + Vitamin D supplement. Known for their ability to relax and calm your mood, carbohydrates can contribute to sleepiness. A diet high in protein and lower in carbohydrates may help to improve mood, stimulate energy and chase away feelings of sluggishness. Protein foods made from amino acids help to stimulate the production of tyrosine, which is responsible for the synthesis of neurotransmitters like dopamine and norepinephrine. These are chemicals in your brain that promote feeling alert and that enhance energy. Low fat dairy products like milk, cheese, cottage cheese and yogurt are good sources of protein, in addition to lean meats, poultry and eggs. Aim to have some protein on your plate at every meal to keep feeling lively and active all year round! Many herbs and spices are notorious for their beneficial effects on health in addition to adding flavor to dishes. Rosemary has been shown to increase blood flow to your brain and improve mood. Like Omega-3 fatty acids, this herb also has anti-inflammatory properties and may even benefit the immune system. Responsible for fighting infection and warding off winter colds and flu, keeping your immune system strong will keep you on your feet and feeling great. 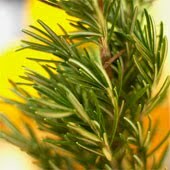 Use Rosemary to season your meals and bolster your immunity this winter season! Just because the sky is gray and the temperature is low, doesn’t mean your mood has to be! Choosing the correct foods (in the appropriate portions) can give you more energy and help you handle those winter doldrums. Joanna Dolgoff, M.D. is a Pediatrician, Child Obesity Expert, and Author of Red Light, Green Light, Eat Right (Rodale, 2009). Dr. Dolgoff’s child and adolescent weight loss program (http://www.DrDolgoff.com) has been featured on WABC News, WNBC News, Fox 5 Morning Show, My9 News, and WPIX News. Healthy Moms is happy to welcome her to our expert team of bloggers. Great post! The Omega-3's definitely make sense. This article was filled with great information, especially the part about rosemary. I had no idea it could increase blood flow to the brain! Thanks for these thoughts. I have been looking into changing my diet for this reason. This helped. I just started using rosemary recently and have gotten to really like it..this is a wonderful post. Thanks for the great tips! I'm definitely read for spring, but these tips with definitely help through the next 6 weeks!